Buy luxurious apartments in Palm Groves to enjoy a sophisticated lifestyle !! Homeowners willing to move into a luxurious abode on Anekal Main Road should definitely have a look at Palm Groves, a residential project developed as a joint venture between Karsten Homes and Aryan Hometec. You will enjoy the tranquil environment around the estate, with enough greenery and sophisticated living amenities. With easy connectivity to all the important places nearby, the residential estate provides state-of-the art living facilities to the residents. The developers have come up with a superb architectural specimen, crafting the apartments with style and elegance. Large interiors, spacious balconies and windows that lead the view to the mesmerising greens make the apartments ideal for home lovers. 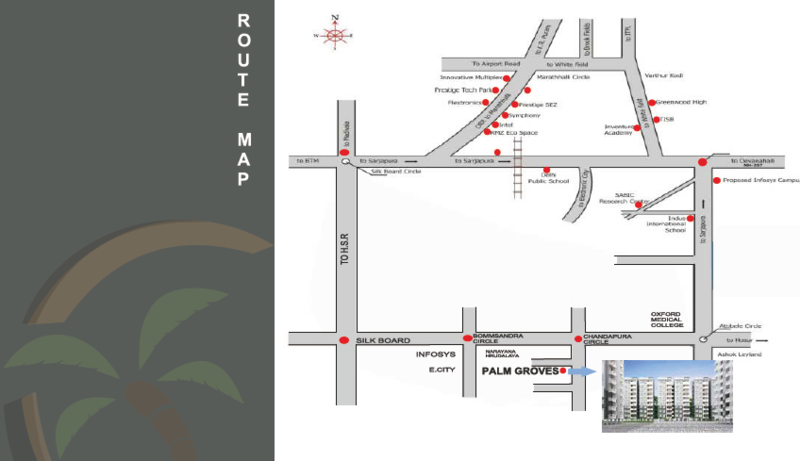 Palm Groves Bangalore is spread across 7.18 acres of land area, with all the necessary amenities that you would need. A total of 855 units are housed in 4 units in the residential complex. The complex has 2 and 3 BHK apartments which are customised for high-end and mid-range budgets. With extensive open areas around, the residents will get the taste of a cultured lifestyle here. The residential estate is located close to Bengaluru, the IT capital of India. Evidently, job opportunities are tremendous for people residing in the apartments here. The infrastructure of the area has undergone a revolutionary change in the last few years, with up gradation in the roadways, security systems and transportation facilities. Evidently, the Palm Groves price is on the rise. You can book an apartment now for yourself, whether you want it for commercial purpose or residential use. A large number of prominent economic sites are located close to the region. These include the Electronic City, Hosur and Jigani. The area is also close to a number of tourist spots. Entertainment facilities around the residential complex are plenty. You can always hop into the restaurants and shopping malls, whenever you want. Several multiplexes have come up in the region in recent times. Altogether, the social infrastructure on Anekal Main Road is quite impressive. Residents living in the apartments will find no hassle in moving around the city. A well-planned transportation system ensures easy navigation throughout the area. Educational and healthcare infrastructure in the area is well-developed. You will find easy access to a number of hospitals. The important schools in the region include St. Joseph High School, Regional Theology Extension Centre, Alliance University, Lincoln Memorial English School, Softech Online Computer Education, and Anekal Public School. When you move to Palm Groves Chandapura, you can get access to all these institutions in quick time. The residential complex comes with sophisticated amenities. These include swimming pool, gym, indoor & outdoor games, and a clubhouse. Besides, the residents can enjoy their time in the landscaped spaces. The tight security facilities and CCTV coverage keep the area protected. Besides, you can enjoy uninterrupted water and power supply all the time. For investors and homeowners, this is the right time to invest in the property in Chandapura. With rising property prices, the apartments are fast getting booked. The residential complex presents the homeowners with classy living facilities, along with a touch of green living. 8 Passenger automatic lift of standard make. Water supply with underground pump and overhead tank with borewall water. A fully equipped club House. Near to IT Hub of E City, Biocon, Wipro, Infosys, alliance University. Located at Chandapur, Anekal Main Road, Bangalore.